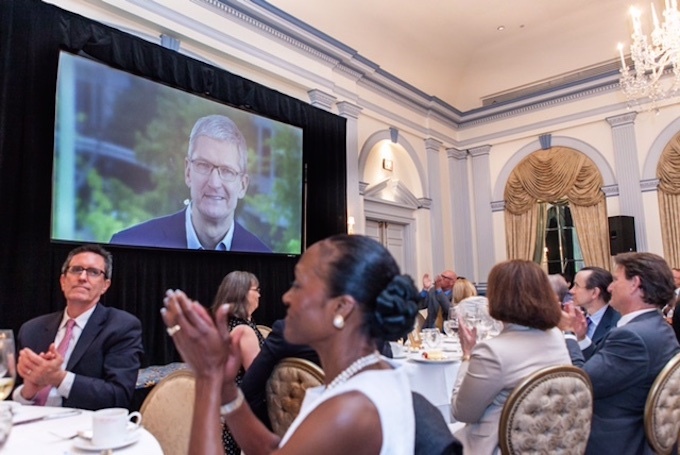 Apple CEO Tim Cook was honored at the Electronic Privacy Information Center's Champions of Freedom event in Washington yesterday, where he took the opportunity to give a speech covering Apple's stance on privacy, the importance of guarding customer information, and the company's views on encryption. TechCrunch has shared details on both the event and Cook's speech, calling him "characteristically passionate" about the topics he spoke on. "Like many of you, we at Apple reject the idea that our customers should have to make tradeoffs between privacy and security," Cook opened. "We can, and we must provide both in equal measure. We believe that people have a fundamental right to privacy. The American people demands it, the constitution demands it, morality demands it." Cook highlighted Apple's commitment to customer privacy while also lambasting other Silicon Valley companies like Google and Facebook for collecting customer data. "They're gobbling up everything they can learn about you and trying to monetize it," Cook said. "We think that's wrong. And it's not the kind of company that Apple wants to be." As he has done multiple times in past privacy-centric speeches, Cook reiterated Apple's position as a company that gets its money from selling products and services, not the personal data of its companies. He also made a subtle jab at Google's new Photos app, which offers free, unlimited photo storage. "We believe the customer should be in control of their own information. You might like these so-called free services, but we don't think they're worth having your email, your search history and now even your family photos data mined and sold off for god knows what advertising purpose. And we think some day, customers will see this for what it is." On encryption, Cook said he believes it's "incredibly dangerous" that some government agencies advocate for unfettered access to consumer data and devices, an issue that's come to light following encryption changes that Apple introduced with iOS 8. As of iOS 8, Apple no longer stores device encryption keys, making it impossible for the company to bypass a passcode and provide consumer data at the government's request. According to Cook, weakening encryption with a "master key" for the government has a "chilling effect on our First Amendment rights and undermines our country's founding principles." He says Apple will continue moving forward with encryption and will focus on building products "that keep people's information safe." More of what Cook had to say during yesterday's speech can be found over at TechCrunch. The Verge has also shared details on the speech. This is pretty radical speech given the past decade. Glad Apple is unafraid to say this obvious truth. Google's free photos service was the first non-Apple platform that actually made me consider using it. However, after I remembered that Google makes their revenue through advertising I thought against it. Apple isn't exactly innocent of this. They just do it on a smaller scale. If they didn't, how could Apple know what type of music I like and make "Genius Recommendations?" They keep and use data from past music purchases and gather data from my iTunes Match. The one thing I respect Google for is that they’ve never hidden the fact that they’re evil. If I ever use a Google product, no matter which one, I know that they will datamine the **** out of it. Apple is at best ambiguous with some good intentions, but it’s not enough. Apple is not at all transparent about the data they already have on you and they don’t make it easy to leave them behind either. You can’t delete your Apple ID and you can’t review the data that is in the cloud. In addition, iCloud on my iPhone is painful. I frequently noticed that iCloud Keychain is switched on, which I never did myself. This should never be possible and it still makes me really uncomfortable that I don’t know what my iPhone does sometimes. I don’t know whether Apple discards the data when I turn off iCloud Drive for a specific app and I can’t even see which apps store data in iCloud. Last month I downloaded an old app that I had in my library and it restored the user data as well, despite not being mentioned at all in iCloud Drive (not even a toggle). So what is actually in that cloud and why can’t I see or control it? Do I have to create a new account to get a clean slate and just accept that the old account will stay there forever? Sorry, Apple is just repeating the same old argument again and it’s not getting any better. They may not have an incentive to collect as much as Google does, but they don’t have an incentive to be extra careful and pro-privacy either. Consumers have a choice. Love G. Photos. Apple lags so far behind re: AI Tim has to give speeches like this. Losing proposition imho once M comes out, but nice that you all have a choice. I have the choice to not be the product for a company. There is no free lunch and I certainly would rather buy my own lunch, thank you very much. Nice that we all have a choice indeed. I don't agree with the comparison of government surveillance to Google and the like. At least with Google, you know the quid pro quo exchange. Free awesome and super reliable email, but we have bots that mine your email to show you relevant ads. Free word processing and office tools, same deal. Free image storage, same deal. With Facebook, you get social networking software and entertainment of sorts, in exchange for data mining for ad purposes again. If someone doesn't like this deal, they don't have to opt-in, or they can opt-out if already in. With government surveillance, the quid pro quo exchange is much murkier. First, the government seems unwilling to explain what the exact benefits are of their data mining (other than unsubstantiated claims of safety). Second, there is no opt-out. What am I getting in return for the NSA looking at my browsing history and communication metadata?